Please begin searching for programs or set up an appointment with a member of the Pitt Business International Programs team. The team member will be able to provide an overview of options, prices, and scholarships. Please visit abroad.pitt.edu for more details about all programs. You can also visit our blog site, Pitt Business To the World, to see first-hand experiences from Pitt Business students in our study abroad programs all over the world. At the Pitt Business Global Business Institute (GBI), students are able to study and practice business at one of our global Pitt campuses. All GBI locations offer students the option to take part in an international internship, which provides real-time work experience in a global setting. Students can participate in the Pitt Business GBI in Buenos Aires, Florence, London, Shanghai, and Sydney. View the GBI Program page. The International Internship Program (IIP) offers Pitt Business students the opportunity to intern full-time during an entire summer abroad. IIP is offered in the following locations: Berlin, Dublin, Madrid, Mumbai, Paris, Prague, and San Francisco. Most locations offer internships in English and interning abroad through IIP will give you a clear competitive edge in today’s job market. See the IIP webpage for location-specific details, including dates and applicant requirements. The Plus3 Program is your first chance to study abroad at Pitt. This two-week, three-credit study abroad program is for freshman students at Pitt Business, the Swanson School of Engineering, and the School of Nursing. Students have the opportunity to travel to one of seven different countries, each with a different industry of focus. Visit the website to see this year’s locations and industries. The Haller Global Honors Fellowship is a program offered exclusively to incoming freshmen of the Pitt Business Honors Program. Students can complete an early global experience prior to the start of their first semester on campus. 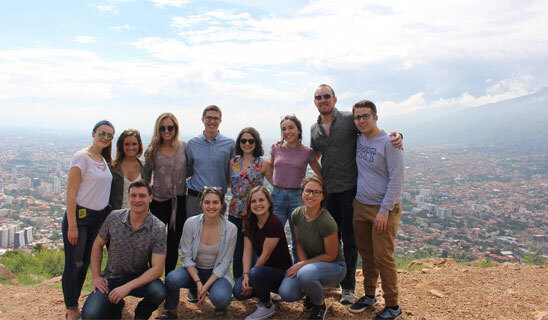 With our International Marketing in Ecuador study abroad program, students embark on an entrepreneurial adventure in the Napo region of Ecuador. This program takes place during Spring Break, for one week. Participants on the International Marketing in Ecuador program will earn one credit through BUSMKT 1511: Marketing ‘Made in Ecuador’ to the World. Pitt Business global service learning programs are offered in the context of an international project in which students use their business skills to make a difference in host communities around the world. Students will develop professional business skills and engage in critical thinking and problem-solving in a new cultural context. 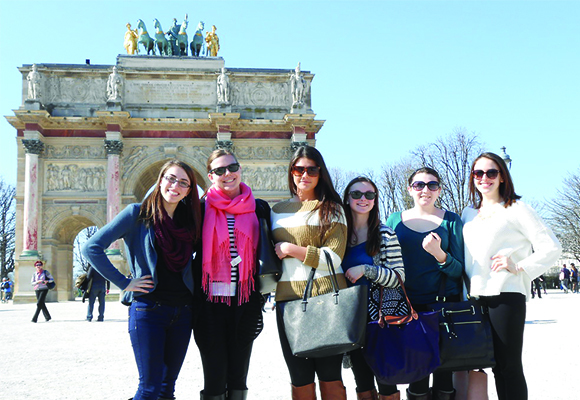 These global experiences are offered in the spring term. With INNOVATE, students explore the relationship between technology, globalization, and leadership in the global marketplace through corporate site visits, guest lectures, and cultural site visits. Participants will take a spring-long course on Pitt’s campus and then will spend five days in Shanghai and five days in Beijing over spring break. Pitt in Prague and Krakow is a summer program throughout the month of May, focused the history, politics, sociology, economics, and culture of post-war Czech Republic and Poland. Participants will earn 3 Pitt credits towards ECON 0905: Czech Republic & Poland: Economy, Policy, and Culture. Pitt in South Africa is a summer program lasting roughly a month beginning in the first week of May. Participants get to experience first-hand the history, educational system, and social entrepreneurship efforts of South Africa. Students choose two of the three offered courses. This program extends through the month of May, in which participants will gain 3 credits. Students live in Montevideo, gaining a theoretical understanding of the supply chain process in Latin America. Students will also acquire a first-hand understanding of the national issues facing businesses in Uruguay. Plus3 Transfer: Ireland is the perfect opportunity for Pitt Business Transfer students who did not have the opportunity to attend Plus3. This two-week, 3-credit experience allows you to gain a firsthand glimpse of globalization through industry-specific company tours, Q&A sessions with executives, and academic lectures that provide cultural and political perspective. Visit the website to learn more and apply. Pitt in Dublin is a four-week summer program in which students earn six Pitt credits. Academic focuses for the Pitt in Dublin program include Business, Marketing, Communication, History, and Urban Studies. Pitt in Japan is a five-week summer program located in Kobe, Japan. Participants will earn six credits. In addition to the mandatory “Japanese Language and Culture” course, students take “Doing Business in Japan” to gain a better understanding of the Japanese business culture and environment. 100% of Qualified Students Receive Scholarships for Studying Abroad!